When you stay at Courtyard Houston Northwest, you'll be surrounded by the comforts of home while enjoying access to a wide array of conveniences. Following a busy day of work or an exciting day of exploring, retire to cozy and spacious guest rooms and suites that feature comfortable bedding, complimentary wireless internet and an in-room coffeemakers. Be sure to visit The Bistro, our cafe-style eatery, for a healthy breakfast or dinner in addition to Starbucks beverages and evening cocktails. A 24-hour Market selling various sundries and to-go meals is also available for your added convenience. When you need to cool off from the Texas heat, take a relaxing dip in our sparkling outdoor pool. And, with our state-of-the-art fitness center, there's no excuse to let your exercise routine get off track. 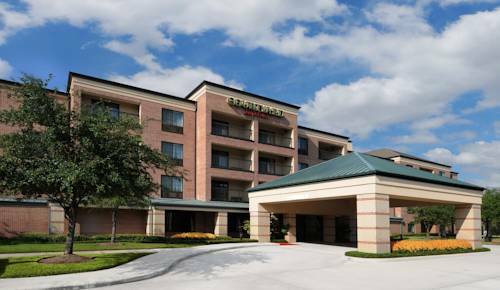 The wonderful location of our Northwest Houston hotel, near Sam Houston Race Park, Houston Premium Outlets and numerous other popular attractions, makes booking a reservation an easy decision. Your Northwest Houston dining destination for refreshing breakfast choices in the morning and a variety of dinner and cocktail options in the evening. The Bistro also offers specialty drinks made with Starbucks coffee to help you get a jump on the day.